If you are on a vacation in Salzburg, you might want to go to a concert for an in-depth experience of the city′s musical heritage. Even if you don′t go to Salzburg explicitly for the Salzburg Festival or one of the many other music events. 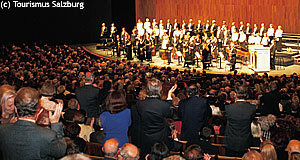 A concert just seems to be part of the "Salzburg experience". You know that, we know that. Unfortunately, many people who work in the tourism industry know that as well. Since that includes a lot of people in Salzburg, it should not surprise you that you will find many "bargain concerts" on offer in the city of Mozart, pretty much all year round. In this article, we try to give you some general advice on how to find concerts in Salzburg with good value for money. Generally, most - particularly the non-touristy - concerts are announced in the daily papers of the region. That would be the "Salzburger Nachrichten", more specifically their "Regionalteil" or regional supplement. It comes with a specific section that lists all concerts of the current day. Otherwise, you can also ask the tourist information centre about a schedule of concerts and whether or not they would consider them to be of low or high quality. The touristy ones are not necessarily bad; most of them concentrate on Mozart and tunes everybody will recognise. They are popular among international tourists and often a bit over-priced; however, by attending one of these tourist things, at least you support local students or recent graduates of the Mozarteum, Salzburg′s music and arts university (link below). The most important "tourist concerts" are held in pretty locations almost every day all year round: The marble hall of Schloss Mirabell Palace; the state apartments of the Festung Hohensalzburg (Salzburg′s Castle); or in combination with a dinner at the Rococo halls of the Peterskeller in the abbey of St. Peter, the world′s oldest restaurants. Expect rather high prices and an audience mostly composed of visitors from overseas. But again, these concerts are usually of rather acceptable quality and if you just want a shot of Mozart to round up your trip, these events might be just perfect for you. One degree of tackiness up on the kitsch-ladder, you will find all sorts of concerts with "The Sound of Music" elements. Again, these might come in combination with an over-priced dinner and a merry audience from North America and the Far East. The "Salzburger Marionettentheater" or puppet theatre, which has famously performed in "The Sound of Music" is half-way down on the road of commercialism; however, their performances of Mozart operas are legendary and popular even among locals. Certainly worth seeing. In terms of authentic concerts, the local daily paper might point you at Salzburg′s theatres: The Kammerspiele and the Landestheater; the RockHouse is great for local, contemporary music and often does concerts of local bands; the Jazzit and the Republic im Stadtkino are nice places for Jazz and off-mainstream concerts; the Festspielhaus and Felsenreitschule sometimes stage concerts and opera off the festival season; our personal "insider-tipp", however, is a particularly valuable one: The Mozarteum Art University has a concert hall (actually, it has several one, but the most important one is the "Großer Saal" or great hall) in which students perform - tickets are often very cheap and the quality as high as it gets for non-festival tickets. Locals keen on cheap or even free concerts would probably look for concerts by "Musikschulwerk" or other music schools or university ensembles; however, with these you always run a risk that you might waste an evening in Salzburg. Good value for money, but less mainstream are the "5-Uhr-Konzerte" ("concerts at five" - link below), which are dedicated to the Baroque composer Johann Michael Haydn (the brother of the ore famous "father" of the Vienna Classic, Joseph Haydn). These concerts are done every day except for Wednesdays during the summer (July to September) at the monastery of St. Peter. Do also keep an eye of church services; there might be special ones in which choirs perform Mozart services. Other concerts we would like to mention are of the seasonal kind: During advent, Salzburg is flooded with tourists and Christmas carol concerts and other seasonal performances are done everywhere - for example, at the castle or in Schloss Hellbrunn palace. The most "authentic" Christmas concert, however, is the Salzburger Adventsingen. Unfortunately, it requires a high level of German language skills, as the songs are performed in thick Salzburg accents. Salzburg′s showcase concerts, however, are all concerned with the festivals: "The" Salzburg Festival in July and August; as well as the Salzburg Easter Festival (Osterfestspiele) and Pentecost Festival (Pfingstfestspiele).